Many of us here in DC are familiar with Ron Mueck's work. I was in for a further treat when I encountered his looming sculpture Boy in Arhus (Denmark) a few years back. Ron has honed his skill at making hyper realistic sculptures that portray humans at key stages in the life cycle, from birth through middle age, to death. And above all, he's a master of playing with scale. Ron has a wonderful background that is beautifully circuitous but makes perfect sense with 20-20 hindsight. He was born in Australia, the son of German-born toy-makers. He grew up making creatures, puppets and costumes in his spare time, experimenting with materials and techniques. He started his career as a model maker and puppeteer for children’s films (Labyrinth, The Storyteller, etc). Later he was making photo-realistic props and animatronics for the advertising industry. 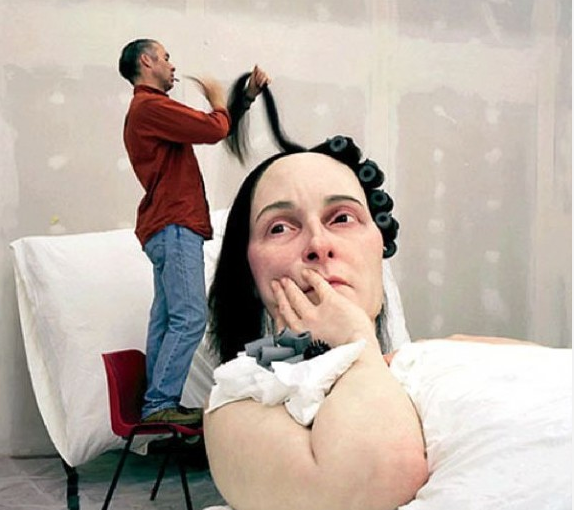 In 1996 Mueck transitioned to fine art (hoorah!) and in 1999 he was appointed as Associate Artist at the National Gallery, London. Bravo! Enjoy.